Have you had to brave the post office to send out packages yet? We are packing up the boxes with treats right now for those friends and family members out of town and the post office will have to be visited Friday. Wish us luck and a short line! A beautiful red, black and white December Daily. If you have never stumbled upon this site you are in for a wonderful treat--thousands of incredible clip art to use in your art and projects. I am going to let you in on to a great resourse for lovely free printables here. For instance these awesome gift card holders found HERE. A new vintage image every day. 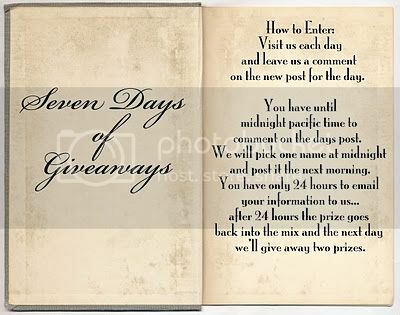 Two extremely talented ladies with an excellent blog full of gorgeous projects are having a giveaway every day for the next week. Also each day concentrates on a different theme--Day 1 Traditions, Day 2 Peace on Earth.